The act of publishing an Intuiface experience doesn't just create a cloud-based copy, it also notifies the Share and Deploy console of the published copy's existence. Once aware, the Share and Deploy console can be used to share, deploy and delete these experiences. To share a published experience, see this article. To deploy a published experience, see this article. To delete a published experience, keep reading below. In the "Manage My Experiences" view of the Share and Deploy console, click the experience you wish to delete. In the information panel that pops open, click the Delete from storage button. 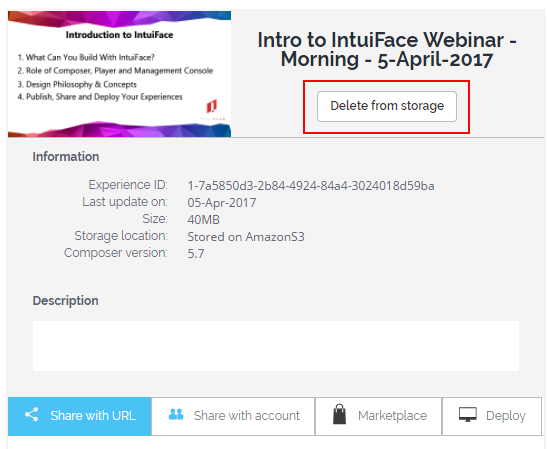 This action will remove the experience from your cloud storage provider AND remove all shares you created for that experience. Do not manually delete published experiences from your cloud storage provider. The Share and Deploy console will be unaware of the removal.